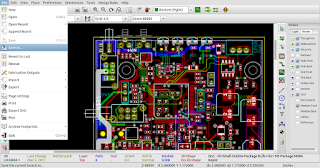 In keeping with the monthly feature release schedule for pcb-rnd, on April 1, 2017, the gEDA PCB fork pcb-rnd will release new features designed to enhance backwards compatibility, improve compliance with ISO 3098, and anticipate future needs of users. 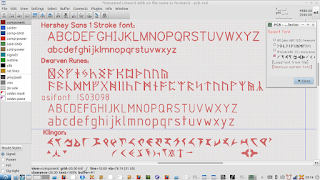 The ASCII character set has been ported from the ISO 3098 compatible open font osifont to the new pcb-rnd polygonal glyph format, to allow its use in PCB layouts. 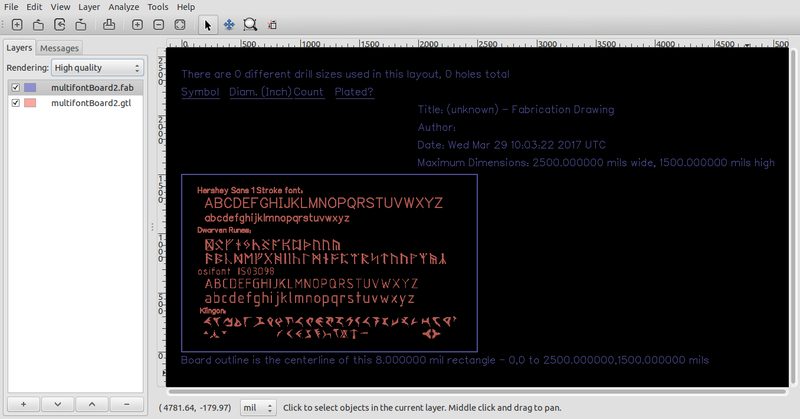 This complements the existing stroked default font, as well as the stroked Hershey Sans 1 Stroke Font, also available for use within pcb-rnd. 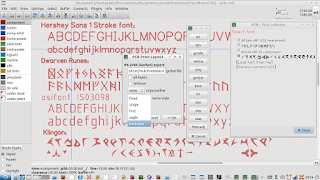 The commitment to ongoing support for legacy users has been cemented with the addition of a Runic font, believed to be popular among Numenoreans who, it is thought, continue to use awk, C89, and at times, scheme. 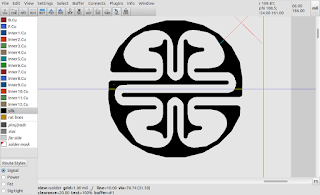 Looking forwards to future users, and in particular, the Treaty of Organia in 2267, a Klingon pIqaD HaSta font has also been ported to pcb-rnd. 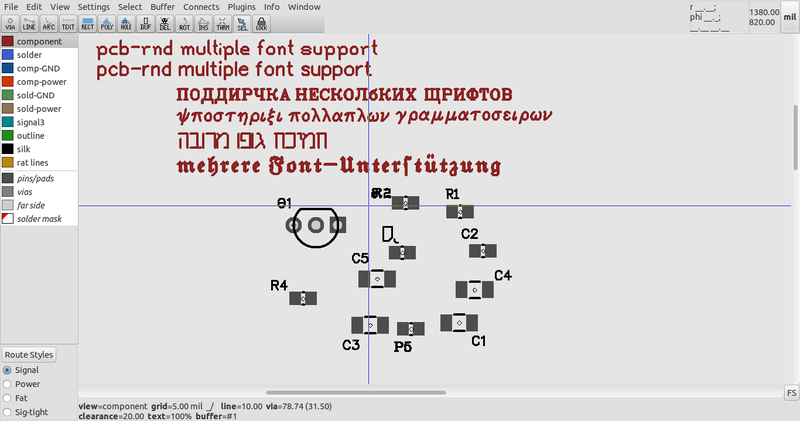 pcb-rnd retains support for the traditional gEDA PCB font file format, as well as the new, more fully featured lihata (.lht) file format which supports lines, arcs and polygons within font glyphs. 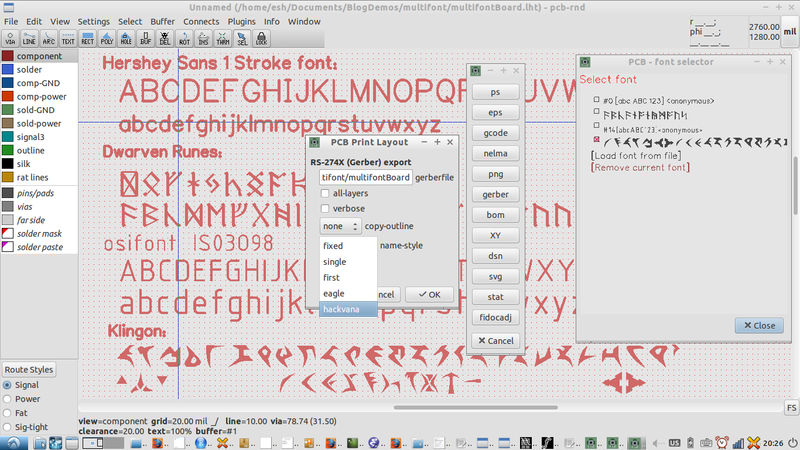 Here's a screen shot of the exported gerber being viewed in the gerber viewer gerbv, showing dwarvish runes, Klingon, osifont, and the Hershey Sans One Stroke font. 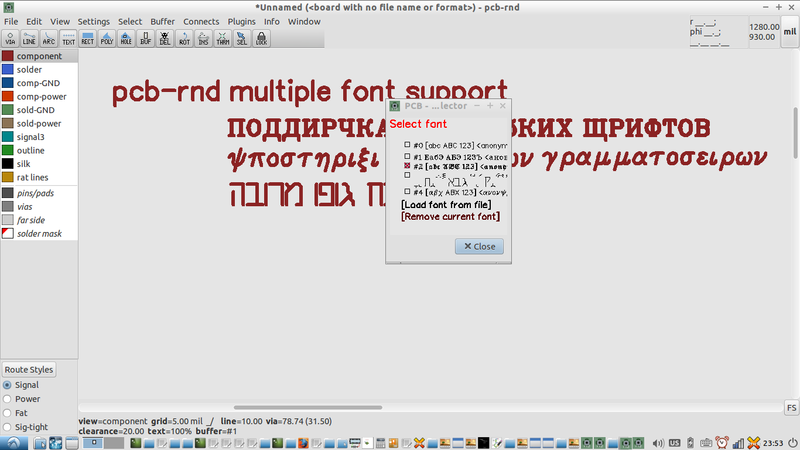 The support for these fonts has been made possible by the multiple font support recently implemented in pcb-rnd, in addition to the newly implemented support for polygons within font glyphs in the new pcb-rnd lihata (.lht) file format used for both pcb layouts and font files. 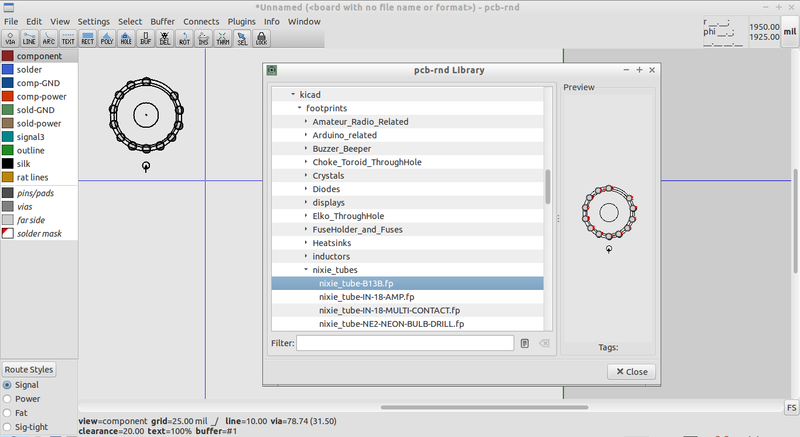 To join in on the fun, head on over and grab yourself a copy of pcb-rnd. 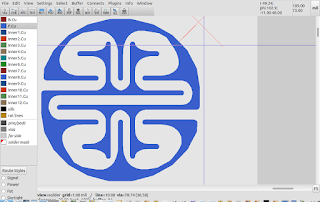 To convert truetype fonts into pcb-rnd compatible lihata font files, you'll need to use the Apache Batik utility ttf2svg to convert the desired glyphs to SVG glyphs. 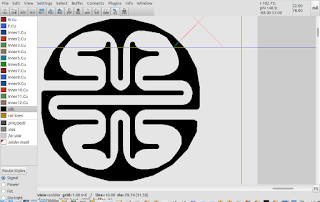 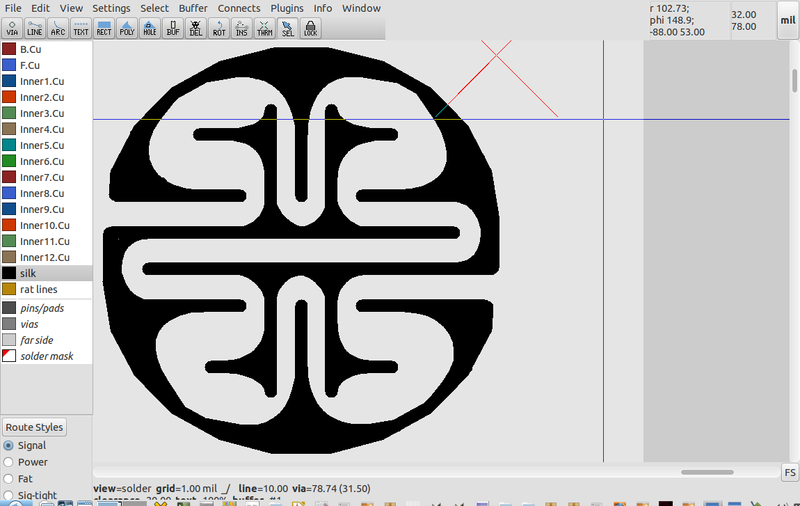 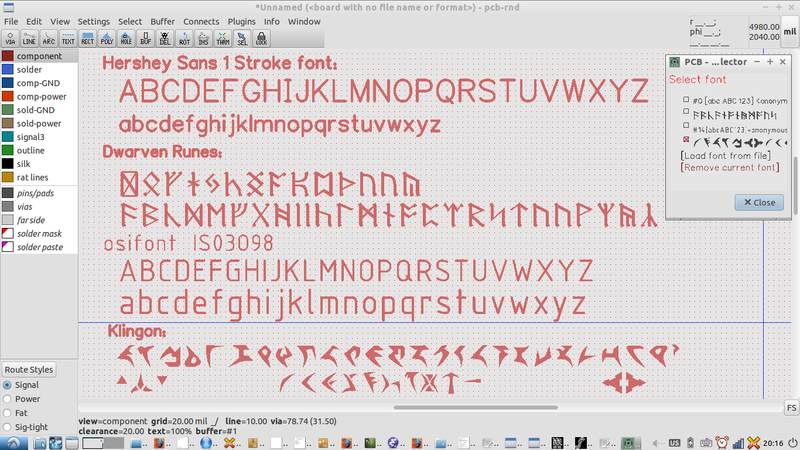 These SVG glyphs can then be converted to a pcb-rnd compatible font file with the outlineFont2centrelineFont utility. 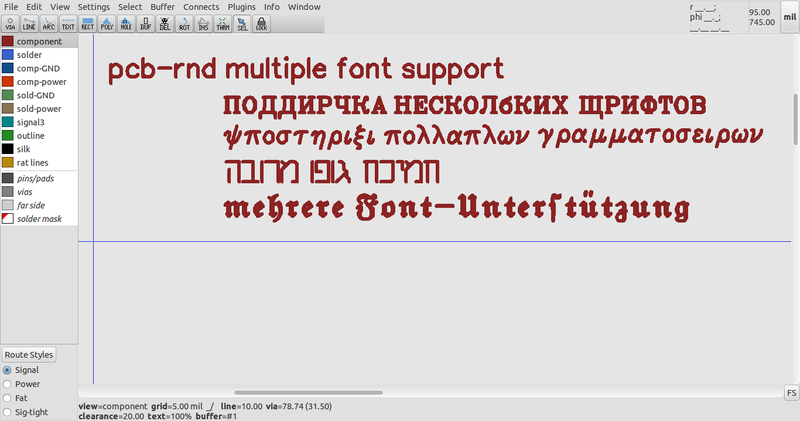 The outlineFont2centrelineFont utility is still a work in progress, but it was used to generate the Klingon, Dwarven Rune and osifont files pretty quickly and easily. 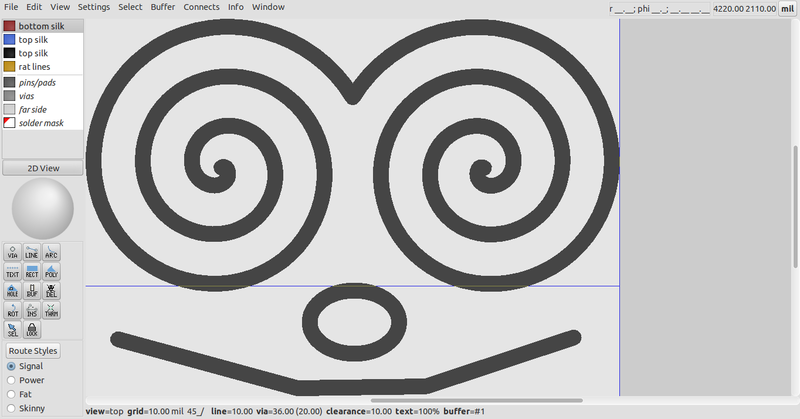 The outlineFont2centrelineFont README explains how to go about doing the conversion. 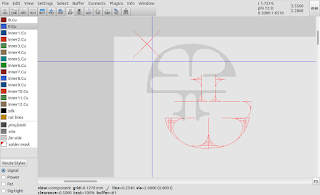 All that remains to be done with it is automatic merging of inside and outside paths in truetype or svg glyphs (these were done manually for the fonts shown). 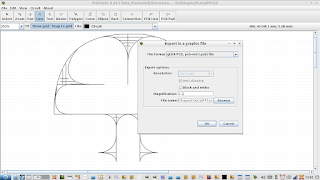 The EDAkrill project is an effort to create a platform and toolchain agnostic repository of footprints, symbols, fonts and anything else EDA related. 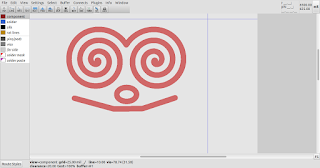 Inkscape is a powerful FOSS vector graphics tool that allows editing of complex paths which can then be exported to various formats. 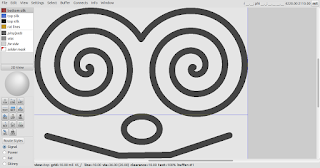 After looking at an Inkscape HPGL export module written by Aaron Spike, a pair of python modules were written, based on the Inkscape's HPGL exporter. 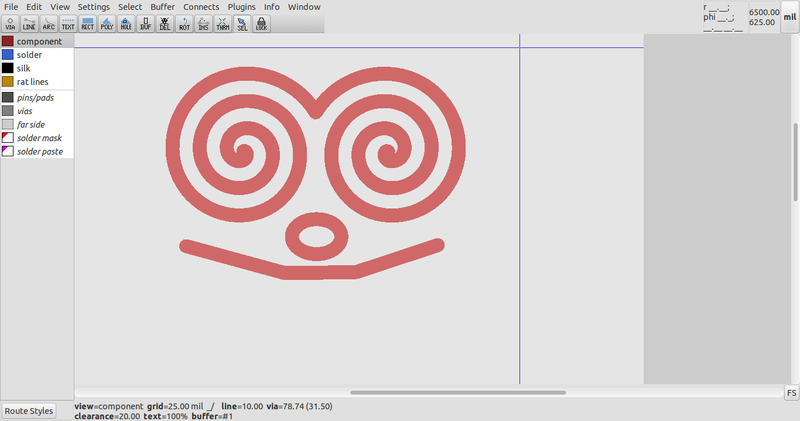 and the *.py and *.inx scripts need to be copied (you'll probably need sudo / superuser privileges) into your local inkscape extensions folder, i.e. 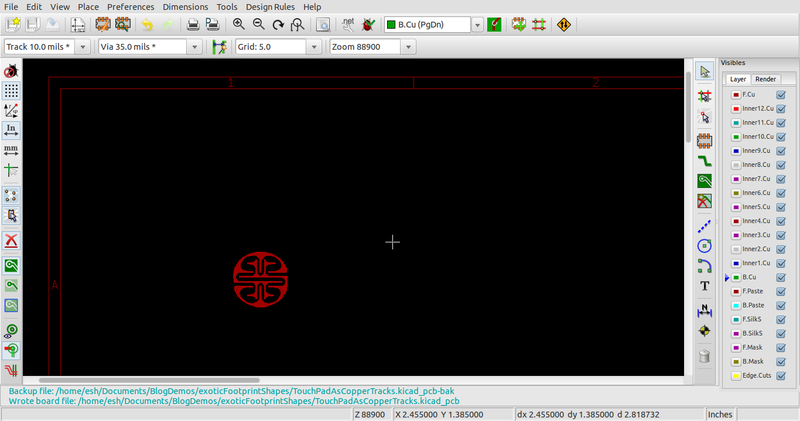 And here's the layout exported as a footprint, being viewed in gEDA PCB. 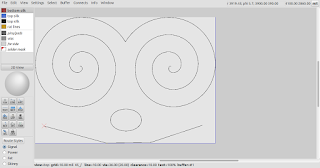 Naturally, KiCad users can use the same scripts to export footprint designs, since KiCad can import gEDA PCB footprint (.fp) natively. 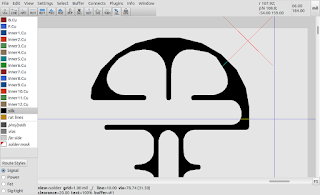 There may be scope to improve the code by implementing export of solid polygons, but more needs to be learned about Inkscape's internal data structures first. 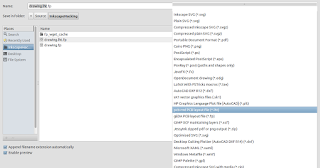 Support for specifying line thickness has also been added to the export dialog, and can range from 8mil (default) to 250mil (mil being thousands of an inch, a.k.a. 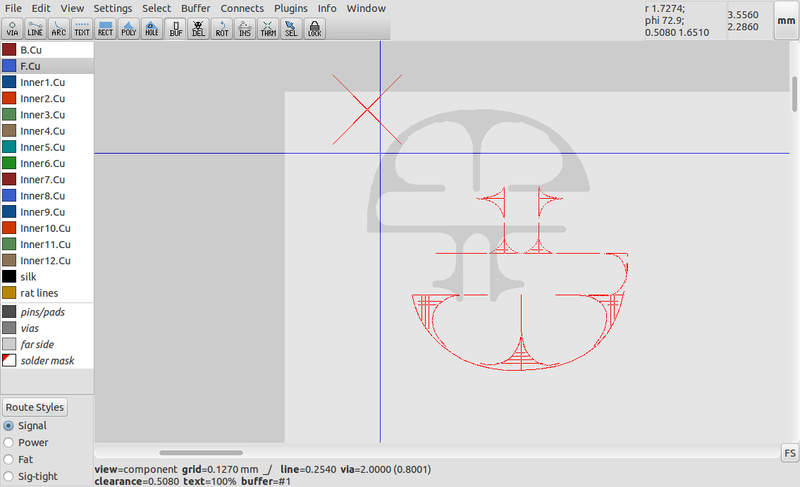 thou, a.k.a. 254 microns, a.k.a. 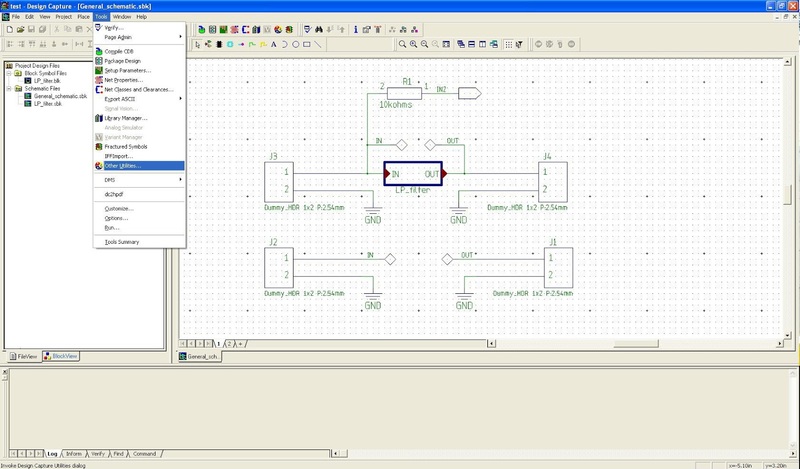 0.254mm). 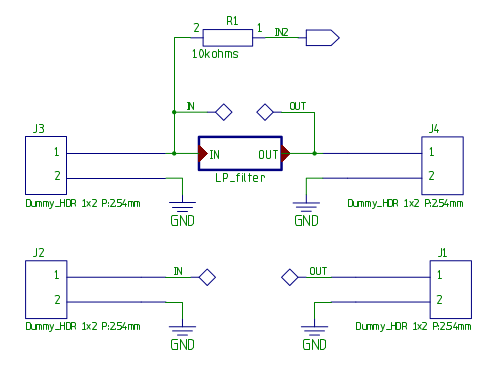 This is a fairly sane range of values, but the thickness can always be changed in gEDA PCB or pcb-rnd if necessary. 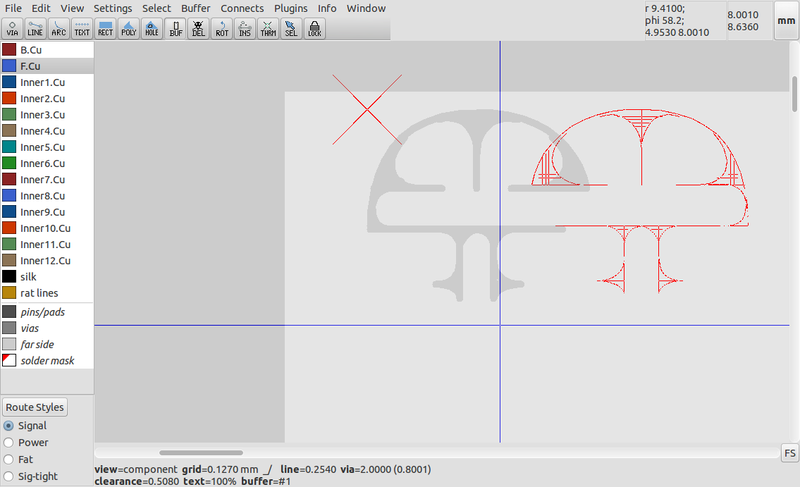 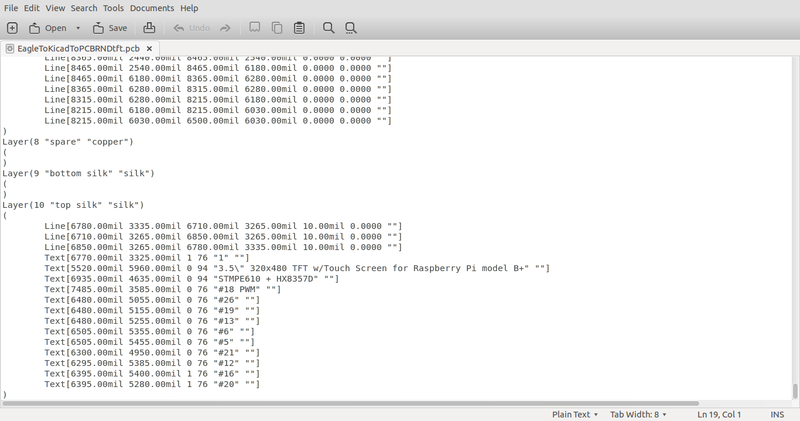 The scripts have been tested with "px" as the default unit of measurement in Inkscape. 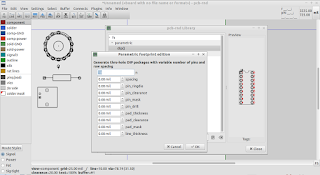 One "px" maps to one mil in gEDA PCB and pcb-rnd; users will need to confirm that exported dimensions are maintained when exporting; if not, the dpi setting could be experimented with for scaling during export. 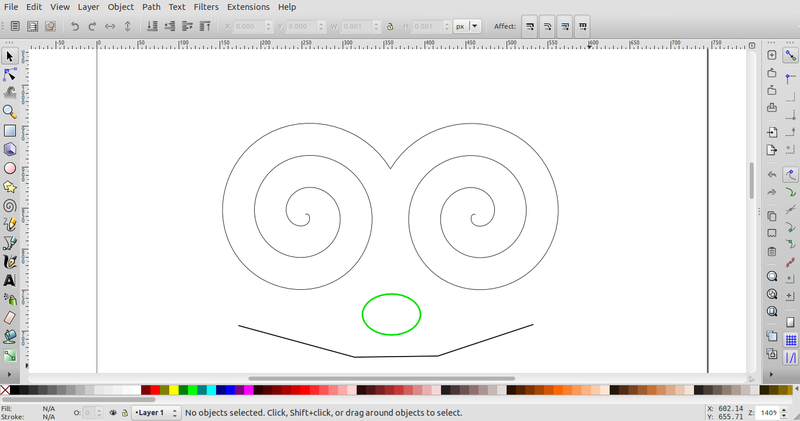 In closing, it should be mentioned that accurate geometry in Inkscape is most easily achieved by individually clicking on nodes, and then manually entering their required coordinates. In the continued effort to have pcb-rnd (the actively developed fork of the gEDA PCB layout tool) support additional import and export formats, the ability to import netlists from the Mentor Graphics Design Capture has now been added and tested. 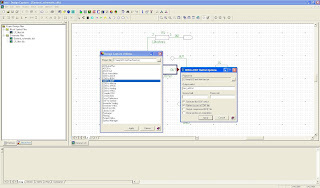 Based on a set of example files supplied by a Mentor Graphics Design Capture user, import has been implemented following reverse engineering of the EDIF files supplied. 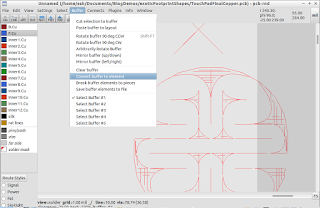 Of note, the importer does not use the old EDIF import code, relying instead on the s-expression parser library more recently developed for KiCad import. 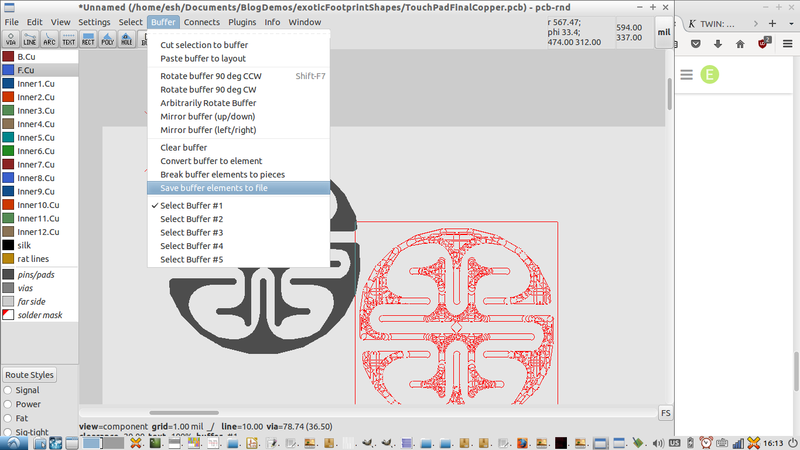 which is a valid pcb-rnd parametric footprint. 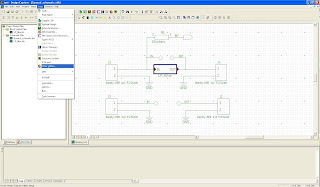 This feature allows those using the Mentor Graphics Design Capture for schematic design to then layout a PCB in pcb-rnd based on the exported schematic netlist. 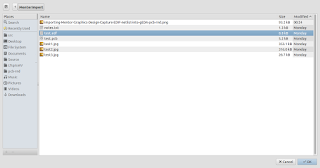 The supported export netlist format is a flattened EDF file. 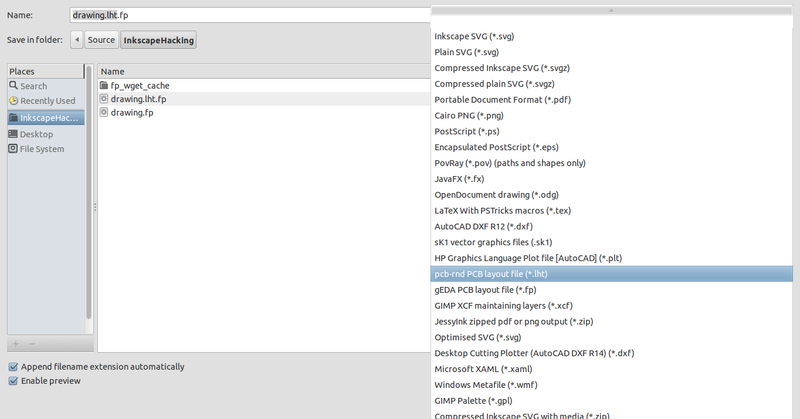 Options for further development and improvements include attempts to import mentor footprints (i.e. 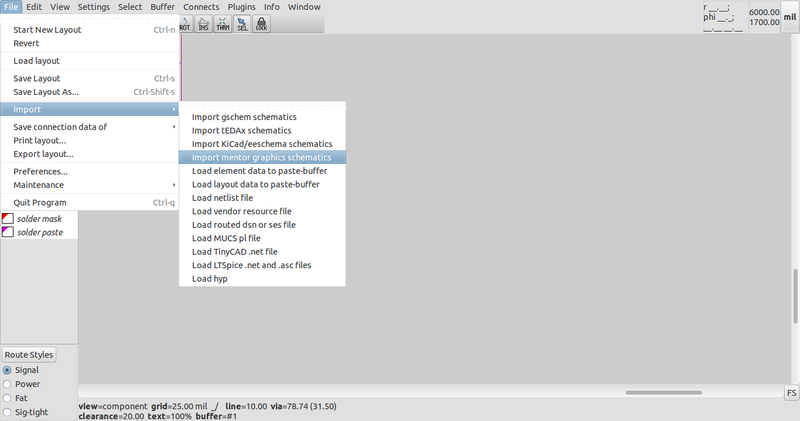 geometry), and possibly attempts to import hierarchic netlists, with subsequent flattening within pcb-rnd. 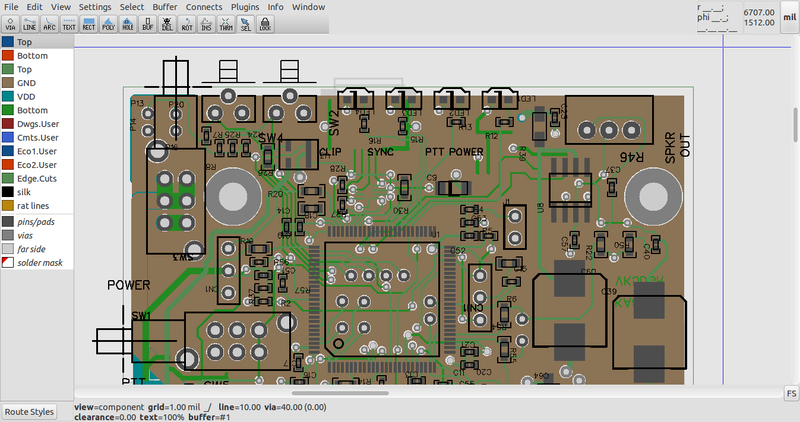 from here, PCB layout proceeds as usual, with, of course, the option of adding additional footprints with the insert 'i' command. 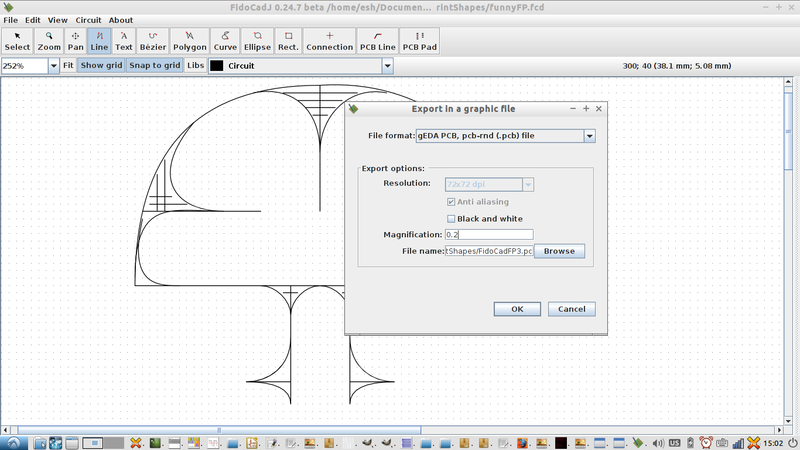 In closing, the pcb-rnd project is keen to enable a variety of workflows and foster interoperability between layout and design tools. 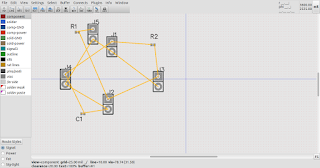 If you have a preferred schematic design tool, or are considering a move away from an existing tool and would like to see the ability to import legacy designs, feel free to get in touch with the developers on irc. 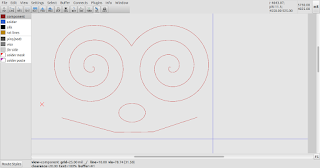 Sometimes there are complex or exotic footprints that need to be made which are most easily achieved with bezier curve, cubic spline and ellipsoidal features in addition to the usual rectilinear elements. 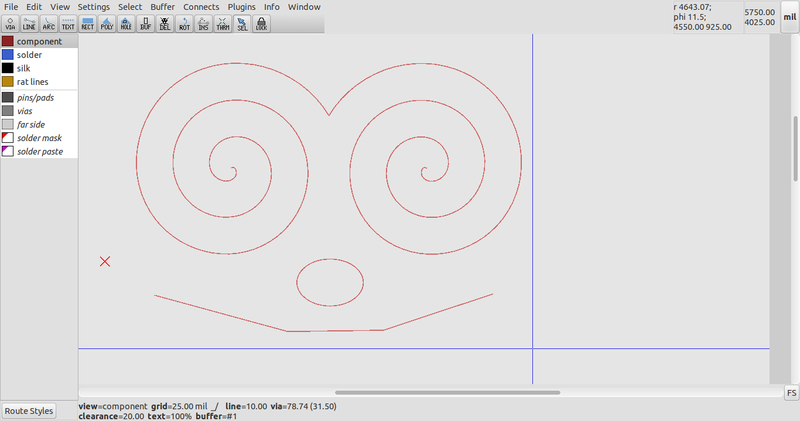 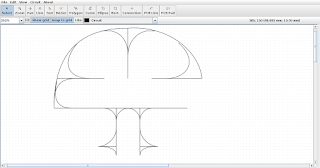 The fairly symmetrical design and filleted features are a natural fit for the cubic bezier, ellipsoid and cubic spline support in FidoCadJ, the no nonsense 2D cross platform CAD package which now has an export module for exporting these design features as line elements in a gEDA PCB / pcb-rnd layout. 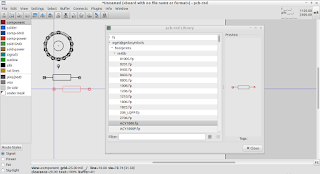 The design was fairly quickly prototyped in FidoCadJ at a scale that suited the features. 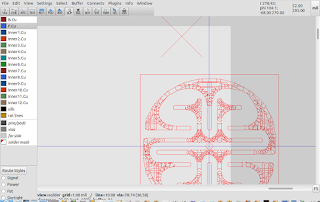 It should be noted that on export, FidoCadJ allows a magnification factor to be provided to allow the design to be magnified or shrunken, so the 5mil grid in FidoCadJ never becomes a limitation. 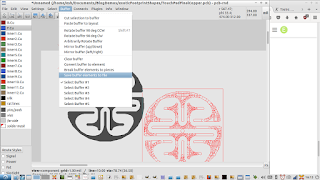 The design was executed on the "circuit" layer in FidoCadJ, since this is the default layer, and when exported to gEDA PCB / pcb-rnd format by the export module, is exported to the rear silk layer with 10mil lines by default. 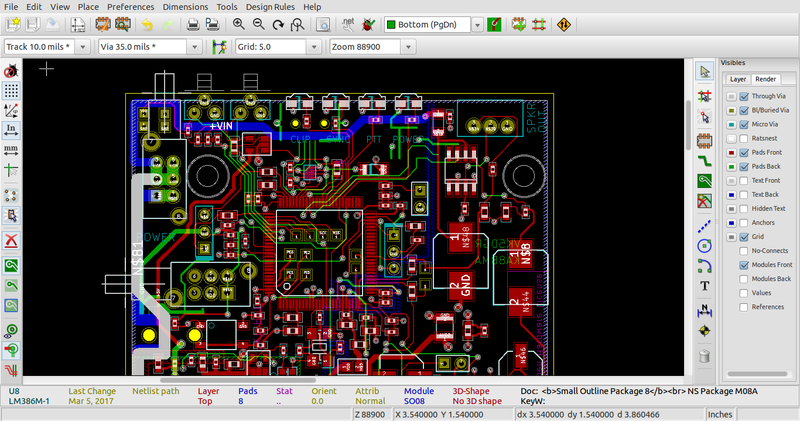 The exported layout was then loaded in pcb-rnd, the fork of gEDA PCB. 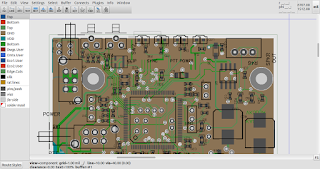 The same process would work with mainline gEDA PCB. The layout can be flipped in pcb-rnd / PCB with the tab key, if the underside is to be viewed, as above. 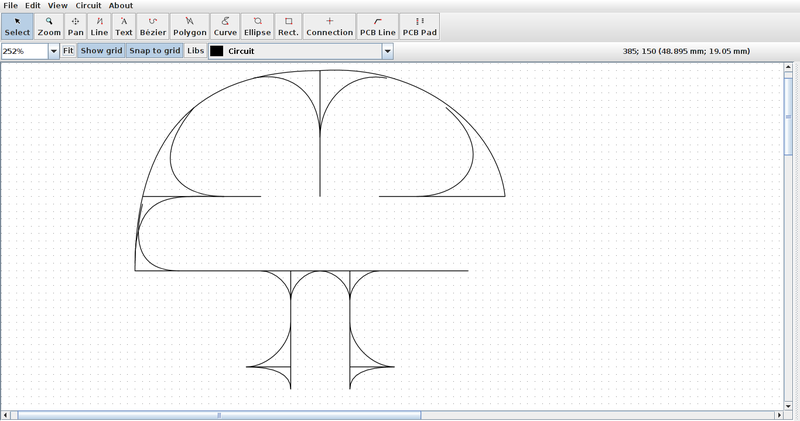 For an essentially round design such as this, a more uniformly contoured outer margin can be achieved by using an encircling ellipsoid, and deleting un-necessary line segments. 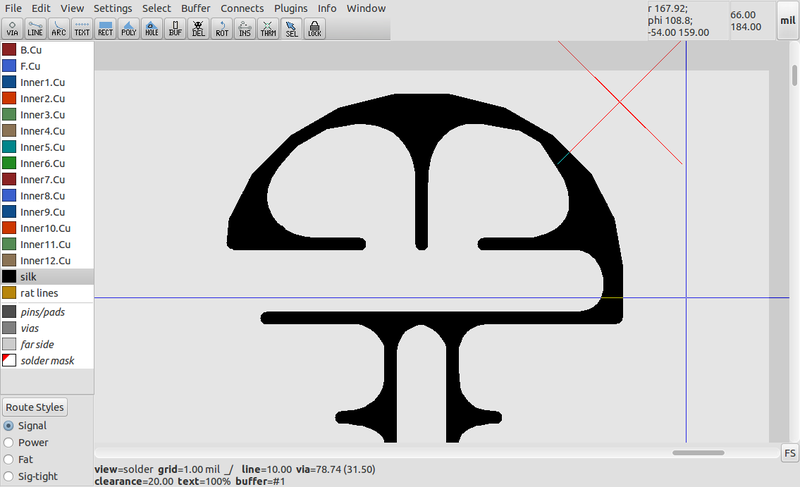 This was ultimately done in this case, to create a more uniformly rounded appearance than cubic beziers were able to achieve. 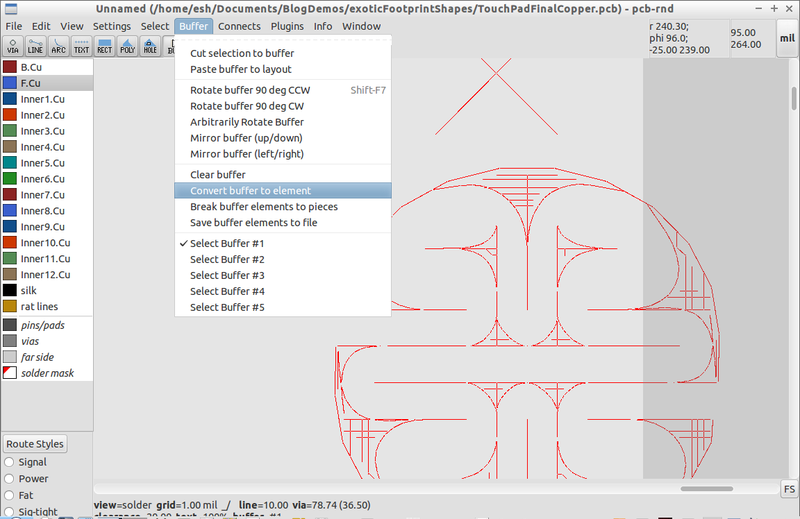 The remaining work required for use with a netlist and design rules checking is suitable numbering of the overlapping pads, to end up with two distinct electrical groups of pads, numbered either pad "1", or pad "2". 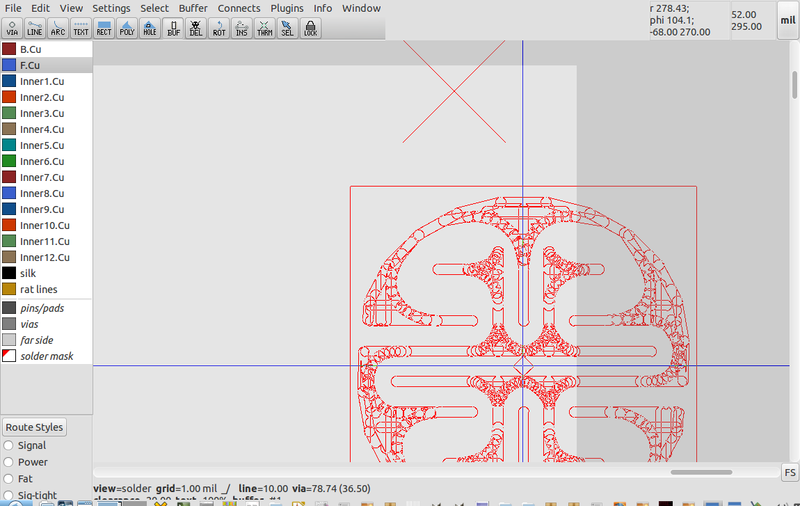 In a complex footprint design like this (ultimately with 401 distinct pads! 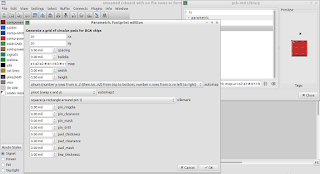 ), this is most easily achieved by loading the footprint into a text editor and doing some search and replace on the consecutively numbered pads. 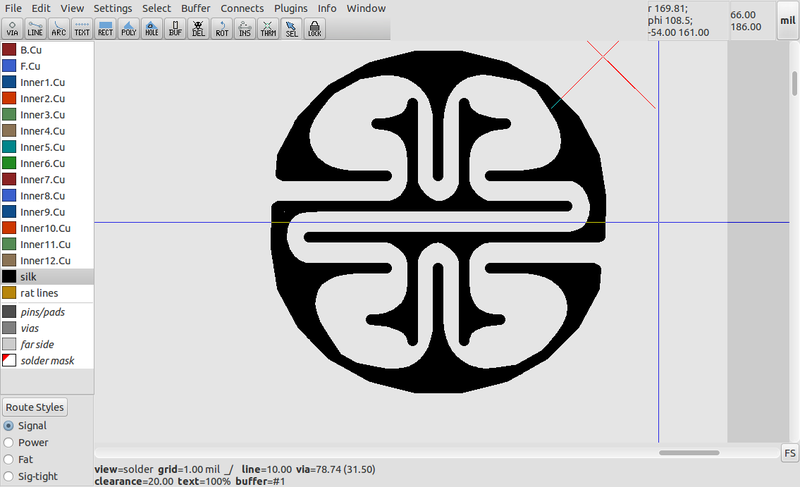 Alternative approaches to creating a footprint like this would include using pstoedit, or tracing outlines in a utility like inkscape, and then exporting in a format compatible with one's preferred PCB layout editor or an intermediate conversion utility. 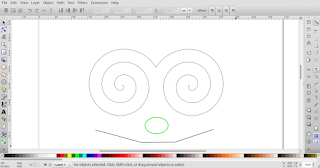 The method described is efficient, and appears to be the quickest and least painful method for complex curve creation in footprints at present. 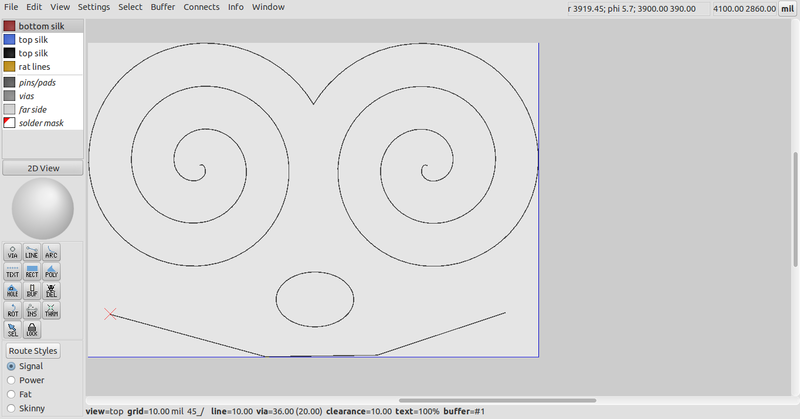 It is worth noting that FidoCadJ now has support for loading a background image, which, with suitable scaling of the image prior to use, can provide a background template for duplication with cubic bezier, cubic spline, line and ellipsoidal elements. 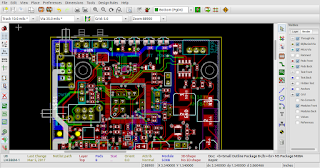 Eagle has been a popular CAD program in some parts of the electronics community for many years, thanks to its multi-platform support and fairly integrated, "one stop shop" offering. 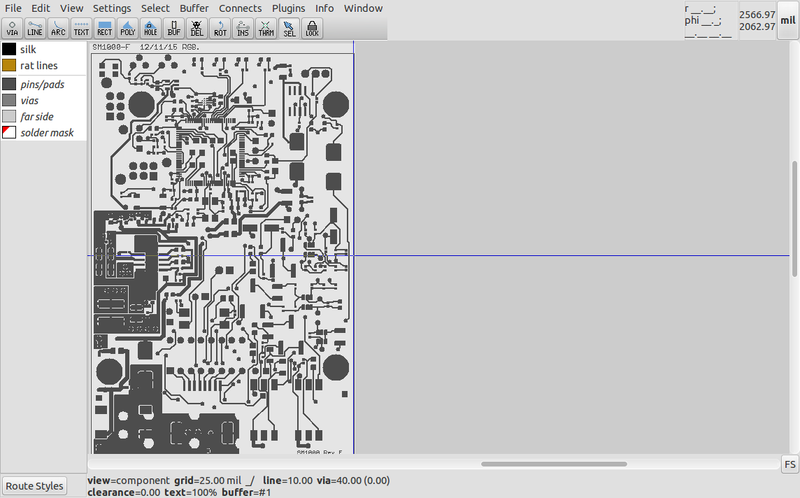 Accordingly, many open hardware designs and community contributed footprints and symbols now exist as a result. 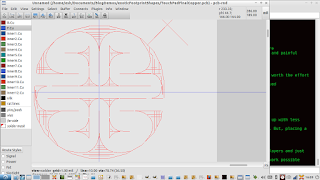 The issue that naturally arises is how best to leverage and extend existing community contributed IP in the form of schematic symbols, footprints and layouts. 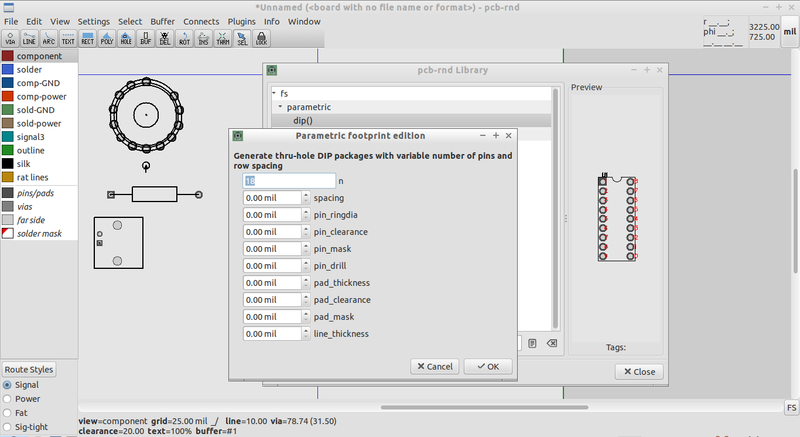 For some time (since the advent of the Eagle XML file format) gEDA users (and by extension, KiCad users able to import gEDA footprints into their pcbnew layout tool) have been able to extract schematic symbols and footprints from Eagle library (.lbr) and board layout (.brd) files by using translate2geda. 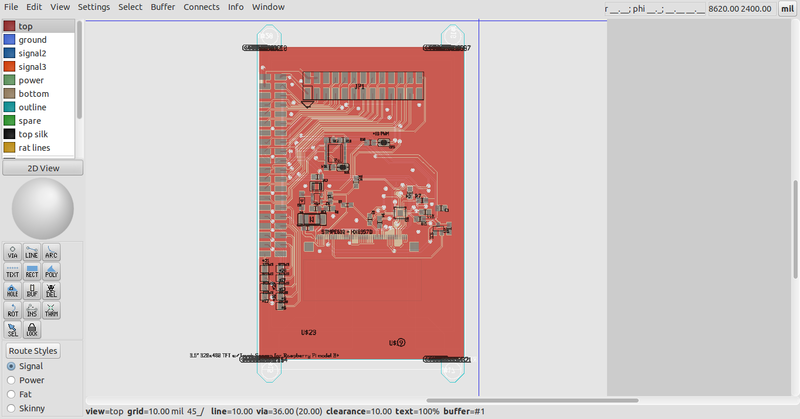 2) board layout conversion has not yet been implemented, due to Eagle's frequent use of rotated footprints within layouts, necessitating some refactoring to allow this to work smoothly. 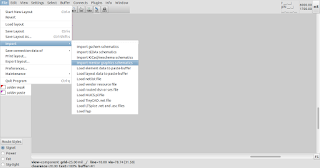 Issues 2) and 3) are simply a matter of finding time to write more code. 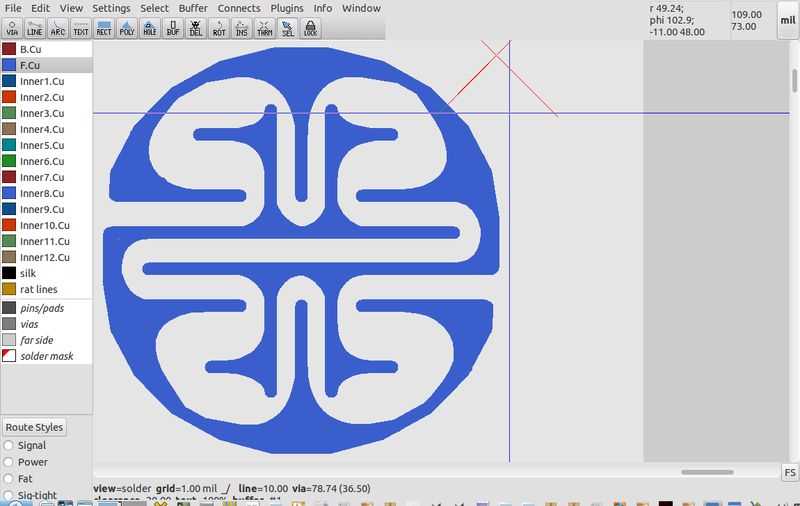 Issue 1) will require extensions to pad definitions within gEDA PCB and pcb-rnd in due course. 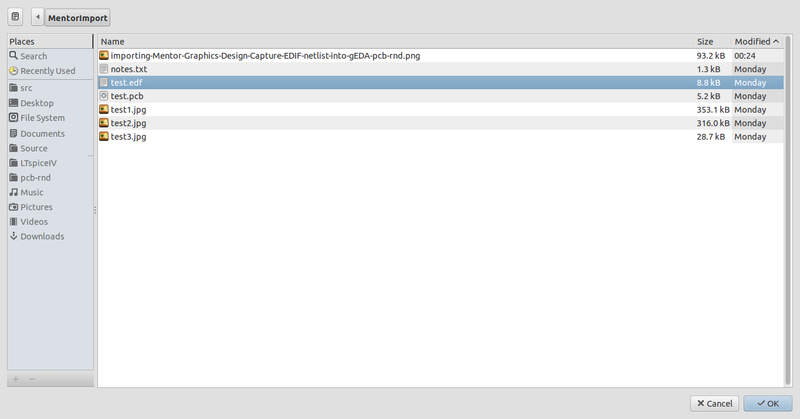 So, how best to get an Eagle layout into a format for use within the gEDA ecosystem? 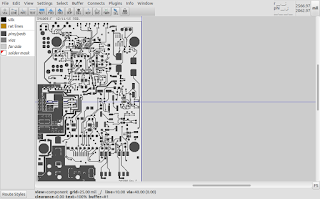 As the good people at UCAMCO hath doth verily spake unto us in their "open letter on standard gerber"
"Consider this happening not just once, but maybe hundreds of times, and in different sizes, across a densely populated PCB, and it quickly becomes obvious that painted features are every CAM engineer's nightmare"
As well as resulting in a bloated design description file (and gerbers), this will limit the usefulness of gerbers converted in this way when it come to snapping items to features in the footprint. 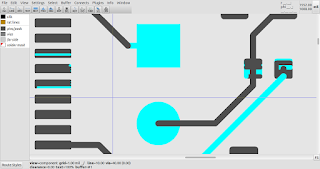 The other limitation is the difficulty translate2geda encounters in trying to identify what is a pad and what isn't during conversion; non square and non round flashed polygons aren't necessarily going to appear on the layout as a pad with heuristics currently implemented in translate2geda. 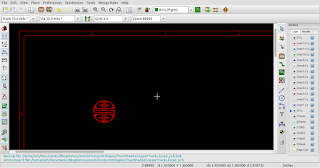 At present, a more workable pathway is to take advantage of the (FOSS) KiCad project's layout editor, pcbnew, which is able to import Eagle XML layouts. 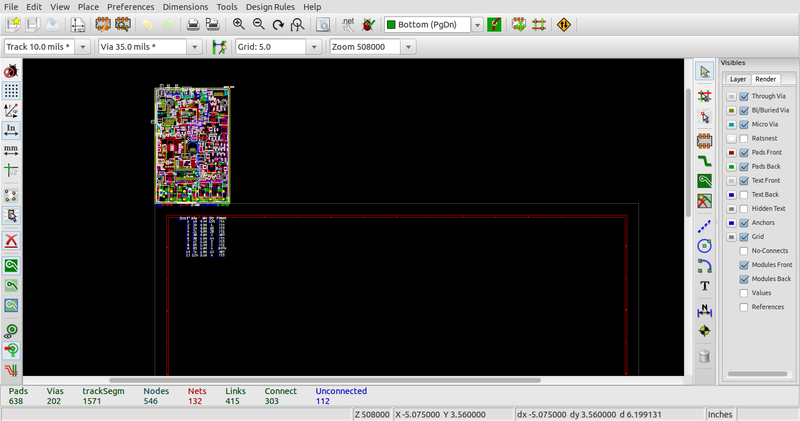 And here is the file dialogue being used in pcbnew to save it in pcbnew's s-expression layout format (.kicad_pcb). 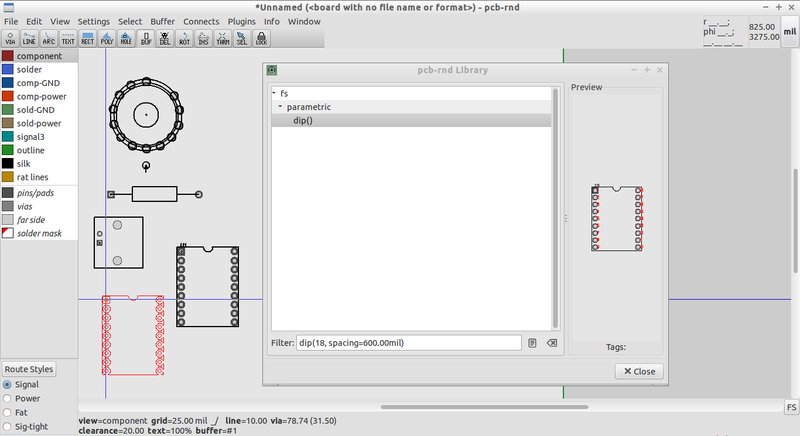 pcb-rnd is a fork of the gEDA project's pcb layout tool, "PCB". From there, you can proceed with business as usual. 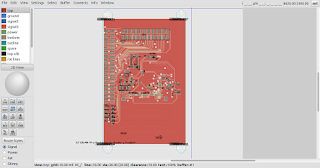 An effective method now exists for sharing open hardware designs and community contributed design elements in Eagle's XML format with the gEDA ecosystem. 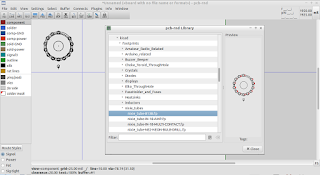 gEDA toolchain users now have multiple options available for extracting design information from Eagle generated gerber files, Eagle board layout files, and Eagle library files with the techniques outlined. 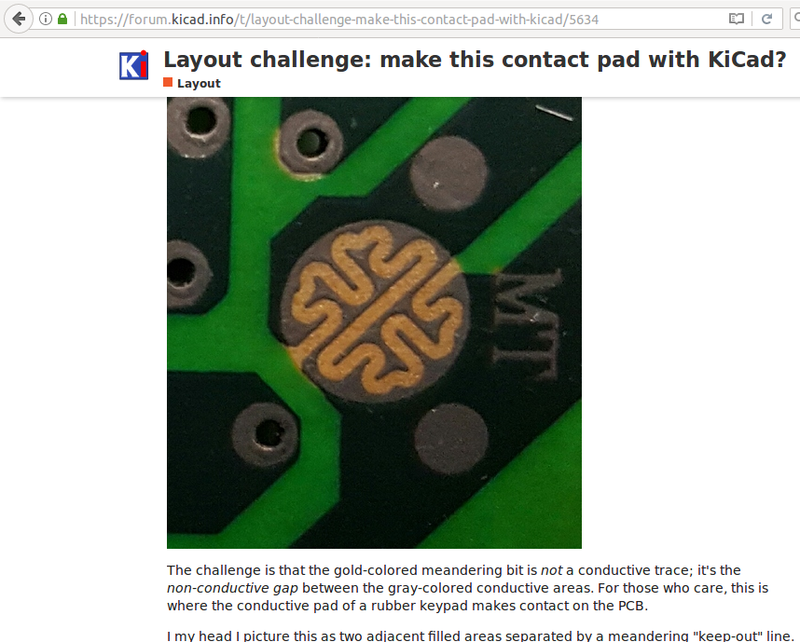 3) KiCad has some peculiar interactions between polygonal zones and via/pin definitions/thermal properties, meaning that these features need to be checked carefully in a converted board. 4) KiCad tends to specify pullbacks from polygonal zones, which are not a feature of polygonal entities in gEDA. 5) KiCad doesn't necessarily translate an imported Eagle layout into a sensible location within the KiCad layout, so you need to select the layout and move it into the layout's bordered area before saving it in .kicad_pcb format. 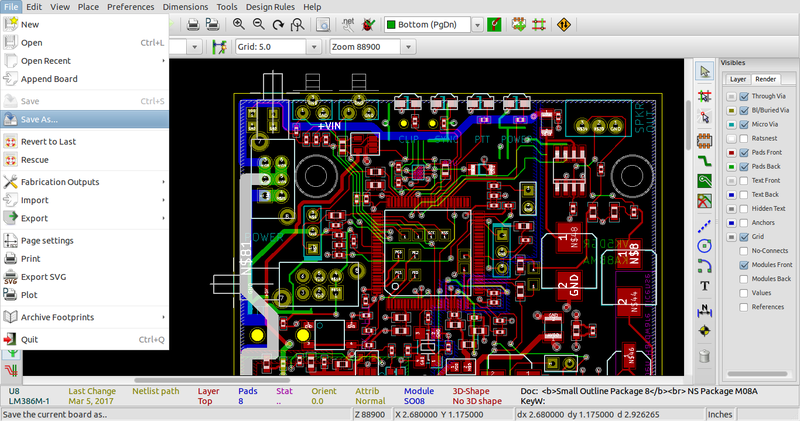 Here's the SM1000 layout before being moved in KiCad's layout window. 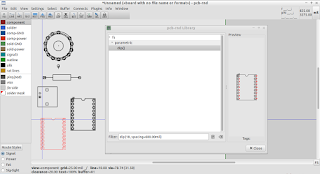 6) converted files are likely to have in excess of 16 layers, which will require a recent build of pcb-rnd, or a recompiled version of mainline PCB with support for an increased number of layers with modifications to the relevant header files. 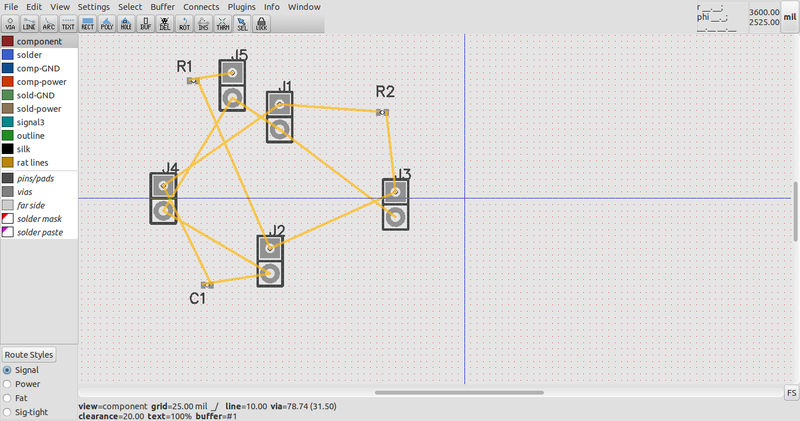 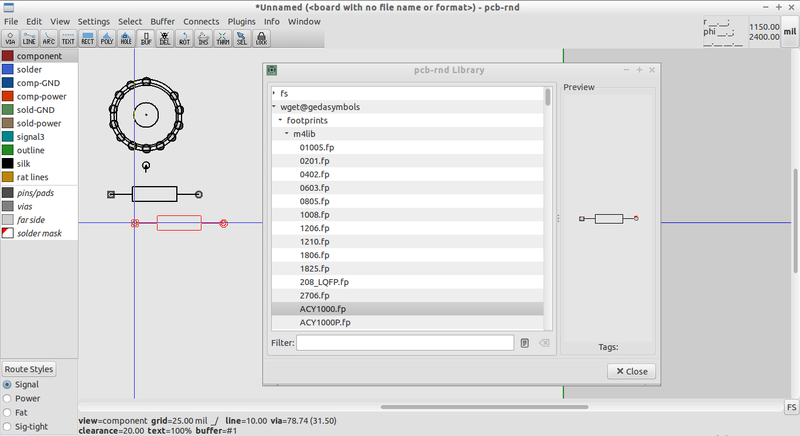 On the fly parametric footprint creation and editing in the pcb-rnd PCB layout editor plus gedaymbols support. 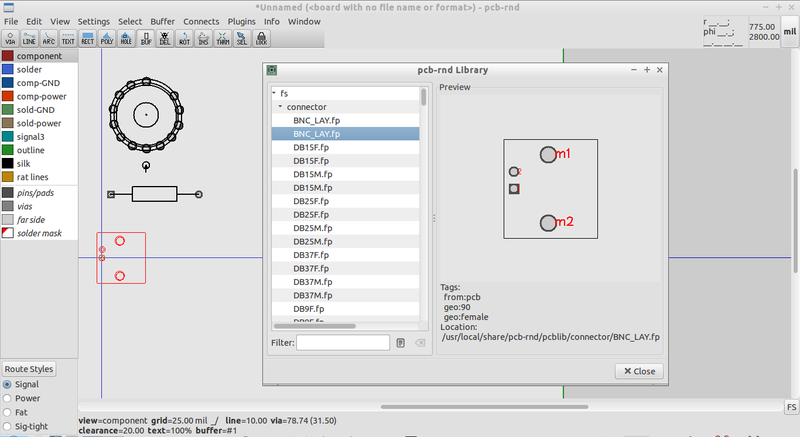 pcb-rnd is a fork of gEDA's PCB layout editor, and aims to continue adding features that improve functionality and improve interoperability with other FLOSS EDA tools and leverage existing FLOSS EDA ecosystem resources. 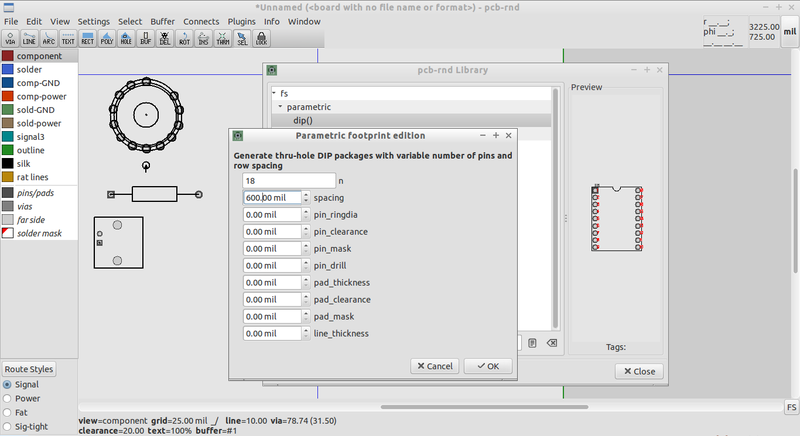 Recent improvements to pcb-rnd include the ability to fine tune footprint parameters on the fly, even while working on a PCB layout, in an intuitive and simple to use parametric feature editing dialog window. 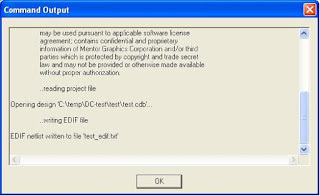 The footprint insertion dialog is invoked by pressing the "i" key while editing a layout. 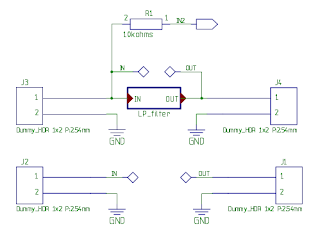 In this respect, element insertion remains much the same as in mainlline gEDA PCB. 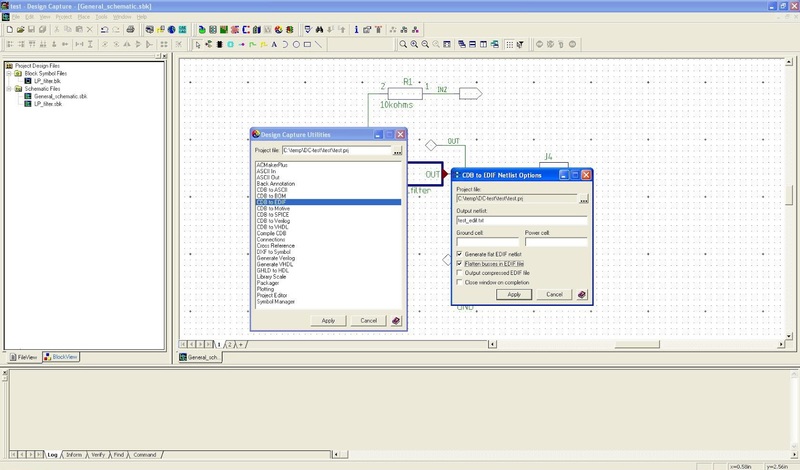 Unlike mainline PCB, the pcb-rnd user has the ability to then browse the local filesystem libraries, specify and edit a parametric footprint, or retrieve a footprint from a web based repository if it has been specified in the preferences. 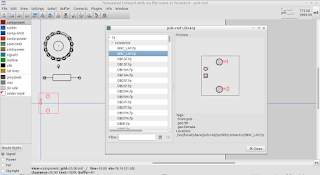 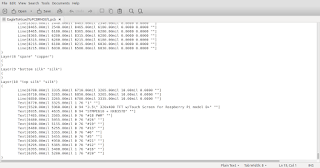 In addition to the options of standard, inbuilt footprint libraries, and parametric footprint creation, pcb-rnd has had the ability to retrieve symbols from web repositories for some time. Once a compatible web based repository has been specified, pcb-rnd checks for updates and caches a list of the available footprints whenever it starts up. 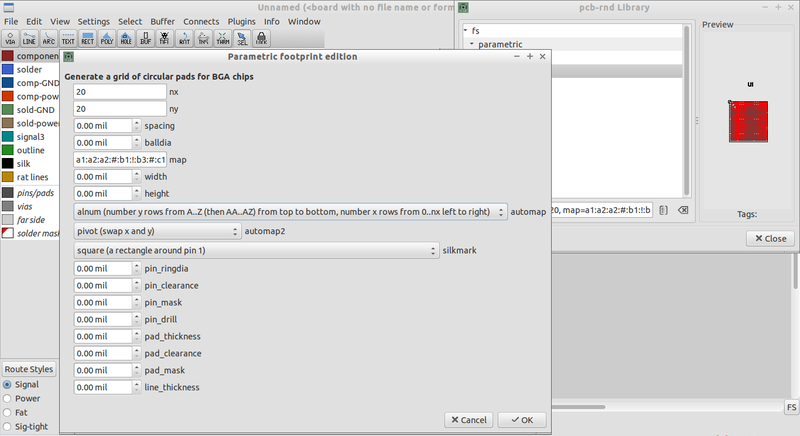 Importantly, any of the parameters generated interactively can also be embedded as footprint attributes in netlists exported by schematic editors, allowing parametric footprints to be specified from the schematic for automatic inclusion in the new layout.